The Union Finance Minister Shri Arun Jaitley Chaired the 25th Meeting of the GST Council in New Delhi today. 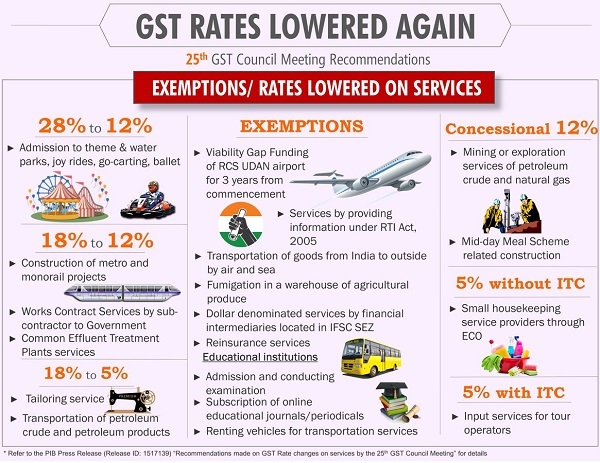 The Council has recommended many relief measures regarding GST rates on goods and services covering many sectors and commodities. The Council has also recommended issuance of certain clarifications on issues relating to GST rates and taxability of certain goods and services. 1. To extend GST exemption on Viability Gap Funding (VGF) for a period of 3 years from the date of commencement of RCS airport from the present period of one year. 2. To exempt supply of services by way of providing information under RTI Act, 2005 from GST. 3. To exempt legal services provided to Government, Local Authority, Governmental Authority and Government Entity. 4. To reduce GST rate on construction of metro and monorail projects (construction, erection, commissioning or installation of original works) from 18% to 12%. 5. To levy GST on the small housekeeping service providers, notified under section 9 (5) of GST Act, who provide housekeeping service through ECO, @ 5% without ITC. 6. To reduce GST rate on tailoring service from 18% to 5%. 7. To reduce GST rate on services by way of admission to theme parks, water parks, joy rides, merry-go-rounds, go-carting and ballet, from 28% to 18%. 9. To exempt services provided by the Naval Insurance Group Fund by way of Life Insurance to personnel of Coast Guard under the Group Insurance Scheme of the Central Government retrospectively w.e.f. 1.7.2017. 10. To exempt IGST payable under section 5(1) of the IGST Act, 2017 on supply of services covered by item 5(c) of Schedule II of the CGST Act, 2017 to the extent of aggregate of the duties and taxes leviable under section 3(7) of the Customs Tariff Act, 1975 read with sections 5 & 7 of IGST Act, 2017 on part of consideration declared under section 14(1) of the Customs Act, 1962 towards royalty and license fee includible in transaction value as specified under Rule 10 (c) of the Customs Valuation (Determination of Value of Imported Goods) Rules, 2007. 11. To allow ITC of input services in the same line of business at the GST rate of 5% in case of tour operator service. 12. 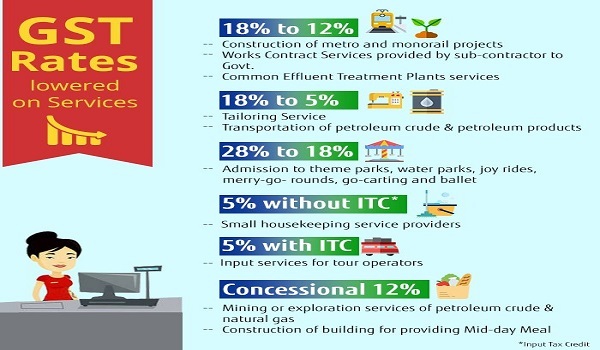 To reduce GST rate (from 18% to 12%) on the Works Contract Services (WCS) provided by sub-contractor to the main contractor providing WCS to Central Government, State Government, Union territory, a local authority, a Governmental Authority or a Government Entity, which attract GST of 12%. Likewise, WCS attracting 5% GST, their sub-contractor would also be liable @ 5%. 13. To enhance the exemption limit of Rs 5000/- per month per member to Rs 7500/- in respect of services provided by Resident Welfare Association (unincorporated or nonprofit entity) to its members against their individual contribution. 14. 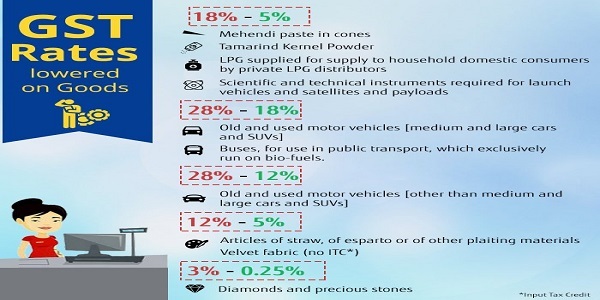 To reduce GST rate on transportation of petroleum crude and petroleum products (MS, HSD, ATF) through pipeline from 18% to 5% without ITC and 12% with ITC. 15. To exempt dollar denominated services provided by financial intermediaries located in IFSC SEZ, which have been deemed to be outside India under the various regulations by RBI, IRDAI, SEBI or any financial regulatory authority, to a person outside India. 16. To exempt (a) services by government or local authority to governmental authority or government entity, by way of lease of land, and (b) supply of land or undivided share of land by way of lease or sub lease where such supply is a part of specified composite supply of construction of flats etc. and to carry out suitable amendment in the provision relating to valuation of construction service involving transfer of land or undivided share of land, so as to ensure that buyers pay the same effective rate of GST on property built on leasehold and freehold land. 17. To amend entry 3 of notification No. 12/2017-CT(R) so as to exempt pure services provided to Govt. entity. 18. To expand pure services exemption under S. No. 3 of 12/2017-C.T. (Rate) so as to include composite supply involving predominantly supply of services i.e. upto 25% of supply of goods. 19. To reduce job work services rate for manufacture of leather goods (Chapter 42) and footwear (Chapter 64) to 5%. 20. To exempt services relating to admission to, or conduct of examination provided to all educational institutions, as defined in the notification. 21. To enhance the limit to Rs 2 lakh against Sl. No. 36 of exemption notification No. 12/2017-C.T. (Rate) which exempts services of life insurance business provided under life micro insurance product approved by IRDAI upto maximum amount of cover of Rs. 50,000. 22. To exempt reinsurance services in respect of insurance schemes exempted under S.Nos. 35 and 36 of notification No. 12/2017-CT (Rate). 23. To increase threshold limit for exemption under entry No. 80 of Notification No. 12/2017-C.T. (Rate) for all the theatrical performances like Music, Dance, Drama, Orchestra, Folk or Classical Arts and all other such activities in any Indian language in theatre GST from Rs.250 to 500 per person and to also extend the threshold exemption to services by way of admission to a planetarium. 24. To reduce GST on Common Effluent Treatment Plants services of treatment of effluents, from 18% to 12%. 25. To exempt services by way of fumigation in a warehouse of agricultural produce. 26. To reduce GST to 12% in respect of mining or exploration services of petroleum crude and natural gas and for drilling services in respect of the said goods. 27. To exempt subscription of online educational journals/periodicals by educational institutions who provide degree recognized by any law from GST. 28. 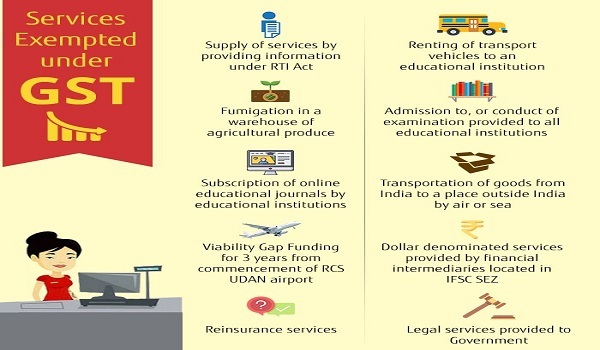 To exempt the service provided by way of renting of transport vehicles provided to a person providing services of transportation of students, faculty and staff to an educational institution providing education upto higher secondary or equivalent. 29. To extend the concessional rate of GST on houses constructed/ acquired under the Credit Linked Subsidy Scheme for Economically Weaker Section (EWS) / Lower Income Group (LIG) / Middle Income Group-1 (MlG-1) / Middle Income Group-2 (MlG-2) under the Housing for All (Urban) Mission/Pradhan MantriAwasYojana (Urban) and low-cost houses up to a carpet area of 60 square metres per house in a housing project which has been given infrastructure status, as proposed by Ministry of Housing & Urban Affairs, under the same concessional rate. 30. To tax time charter services at GST rate of 5%, that is at the same rate as applicable to voyage charter or bare boat charter, with the same conditions. 31. To levy concessional GST @12% on the services provided by way of construction, erection, commissioning, installation, completion, fitting out, repair, maintenance, renovation, or alteration of building used for providing (for instance, centralized cooking or distributing) mid-day meal scheme by an entity registered under section 12AA of IT Act. 32. To exempt services provided by and to FédérationInternationale de Football Association (FIFA) and its subsidiaries directly or indirectly related to any of the events under FIFA U-20 World Cup in case the said event is hosted by India. 33. To exempt government’s share of profit petroleum from GST and to clarify that cost petroleum is not taxable per se. 1. To provide inCGST rules that value of exempt supply under sub-section (2) of section 17, shall not include the value of deposits, loans or advances on which interest or discount is earned (This will not apply to a banking company and a financial institution including a non-banking financial company engaged in providing services by way of extending deposits, loans or advances). 2. To defer the liability to pay GST in case of TDR against consideration in the form of construction service and on construction service against consideration in the form of TDR to the time when the possession or right in the property is transferred to the land owner by entering into a conveyance deed or similar instrument (eg. allotment letter). No deferment in point of taxation in respect of cash component. 4. To define insurance agent in the reverse charge notification to have the same meaning as assigned to it in clause (10) of section 2 of the Insurance Act, 1938, so that corporate agents get excluded from reverse charge. 5. To insert a provision in GST Rules under section 15 of GST Act that the value of lottery shall be 100/112 or 100/128 of the price of lottery ticket notified in the Gazette (the same is currently notified in the rate notification). 6. To add, in the GST rate schedule for goods at 28%, actionable claim in the form of chance to win in betting and gambling including horse racing. 1. To clarify that exemption of Rs 1000/- per day or equivalent (declared tariff) is available in respect of accommodation service in hostels. 2. To clarify that fee paid by litigants in the Consumer Disputes Commissions and any penalty imposed by these Commissions, will not attract GST. 3. To clarify that elephant/ camel joy rides are not classified as transportation services and attract GST @ 18% with threshold exemption to small services providers. 4. To clarify that leasing or rental service, with or without operator, of goods, attracts same GST as supply of like goods involving transfer of title in the said goods. Therefore, the GST rate for the rental services of self-Propelled Access Equipment (Boom. Scissors/Telehandlers) is 28%. 3) Food supplied to the in-patients as advised by the doctor / nutritionists is a part of composite supply of healthcare and not separately taxable. Other supplies of food by a hospital to patients (not admitted) or their attendants or visitors is taxable. knowledge worthy….thanks……to you more than government information scheduled. Looking back, one thought , according to an earlier announcement, the levy was ‘in terms’ applicable only to ‘CHS’ ?! With no corresponding /consequential increase of the aggregate, from Rs 20 lakhs per annum, the per member enhancement is akin to athletic ‘hop step’ , with no ‘jump’ / or crossing the well half-way! Anything amiss, with no clarity ?! very lucidly brought to light.